The Thirty Meter Telescope Project (TMT) is launching a new database containing five years of atmospheric data from the telescope’s initial five candidates sites: Cerro Tolar, Cerro Armazones, and Cerro Tolonchar, Chile; San Pedro Martir, Mexico; and Mauna Kea, Hawaii, the site selected for TMT. A website containing the entire dataset, the largest of its kind, will be released free-of-charge to the public today. The breadth and consistency of the dataset will also make it of value to researchers in climatology, boundary layer physics, aeronautics, and satellite studies, explained Schoeck. The new database includes accurate and long-term measurements of virtually every atmospheric feature that might affect the performance of the telescope, including turbulence strength, temperature, barometric pressure, wind speed and direction, humidity, atmospheric water vapor content, solar irradiance, ground heat transfer, dust levels, and cloud cover. An essential element of the TMT site testing campaign was the deployment of identical equipment at all five sites. TMT also took great care in cross calibrating its instruments. As a result, the data can be compared quantitatively across all the sites with high confidence. The data also cover long enough time periods to be representative for the sites, barring major changes in local or global climate. The database will contain the entire body of work from the site testing campaign in ASCII format; it also will include basic graphing tools. Users will be able to select and compare data from the various sites, data ranges, time periods, instruments, and other parameters. The data will not carry any restriction, apart from a standard acknowledgment guideline. 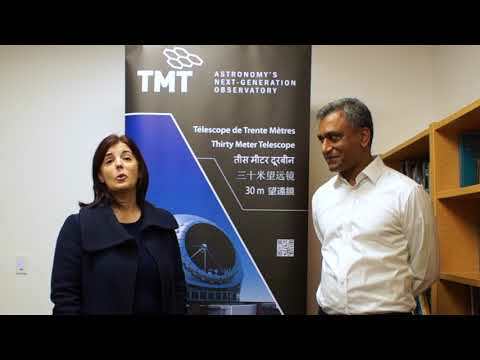 Funding for the site testing campaign, led jointly by TMT and the Association of Universities for Research in Astronomy (AURA), came from the TMT project and the National Science Foundation. In addition to Schoeck, members of the TMT/AURA core site testing team include Tony Travouillon, TMT’s Environment Control Scientist; Warren Skidmore, TMT's Telescope Research Engineer; Reed Riddle, now at Caltech Optical Observatories; and Sebastian Els, now working for the Gaia satellite project in Madrid, Spain. In total, almost 100 individuals at many different institutions around the world contributed to the success of the TMT site testing work. Using the results of the site testing campaign and other factors, the board of directors of the TMT Observatory Corporation selected Mauna Kea as the preferred site for the telescope in July 2009. The TMT project is an international partnership among the California Institute of Technology, the University of California, and the Association of Canadian Universities for Research in Astronomy. The National Astronomical Observatory of Japan (NAOJ) joined TMT as a Collaborating Institution in 2008. The National Astronomical Observatories of the Chinese Academy of Sciences (NAOC) joined TMT as an Observer in 2009. To access the archive, visit sitedata.tmt.org.